We believe a single book can spark a lifelong love of reading. Early Reading provides pre-literacy training materials to preschool, kindergarten, and early elementary school students. The program prepares young children for future school success and fosters reading/language skills that benefit family members young and old. It has been demonstrated that youngsters who read in the home perform better in school. Early Reading stresses the importance of parents reading to children. It has become part of Head Start’s Parent Education Program which teaches parents - many of whom are new to this country and have little formal education - how to support their children’s education. We work with DuPage County and LaGrange area Head Start organizations, as well as local elementary schools in need. 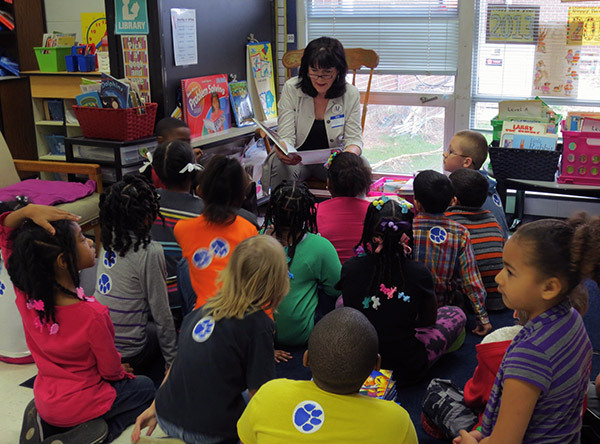 More than 900 students are served by the Early Reading program each year. The Early Reading program consists of two parts: the Backpack Program and the Reading Program. The Backpack Program is similar to a classroom library. We assist each classroom with a set of backpacks containing a book, and parent guidelines for reading to their child. These backpacks are checked out to take home and returned to the classroom throughout the school year. Our backpacks are made of sturdy see-through plastic and contain an appropriate age level story book, crayons, paper, and instructions to parents about how to use the materials. Each backpack has a different storybook in it. Approximately two-thirds of the books are English language. The rest are bilingual or solely foreign language. Careful consideration is given when choosing the books to ensure they are appropriate for the children’s needs and language. Assistance League volunteers visit classrooms that have students with specific needs. Once a year, the volunteers read to the children, work on a related activity, and present the book to students to take home for their home library. For many children, this is the first brand new book they have ever owned. These books and activities are chosen according to the age/grade level and are thematically based to align with the program’s curriculum. Our thanks to Hinsdale Bank & Trust for their generous support of our Early Reading program.